A very popular meter for base station use, this meter is designed to measure v.s.w.r. 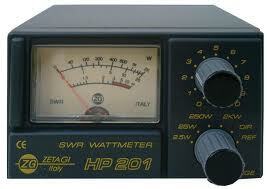 for a frequency range 3-200 MHz, and power (26-30 MHz). The unit has a large easy to ready scale, with two rotary controls for calibration and power readings up to 1 KW.